I received great feedback on one of my auctions. I've been having fun listing and selling my Magic the Gathering cards on Ebay. Its fun to get a little extra pocket money, and they are so easy to ship. I got some great feedback from my first auction of MTG cards! This is from a soldier over in Iraq who is getting ready to set up his own online store next year. I just wanted to add an extra note conserning the Mox Diamonds i puchased. Just wanted to say well done and thank you for a quality item. Most of the time it is hit or miss when cards are listed as near mint, and as a reseller i see it alot. Those cards you sent me are the best quality i have seen through ebay purchases so far, I never list anything as mint, but I would have to say these are pretty much as mint as they get! I have added you to my favorite sellers and hope to continue business with you! Thanks! I had a brainstorm - I am going to use the great Typepad html WYSIWYG (what you see is what you get) html editor to write up my next ebay auction. I got a humongous tax bill, so I want to list a new auction each day and see if I can make a couple of bucks selling these classic strategy game trading cards. MTG: Magic Cards **2x SCROLL RACK** Tempest!!! You are bidding on 2 Magic The Gathering Scroll Rack cards from Tempest. These two cards have been stored in plastic, and I don't recall ever playing them, as I thought they would be worth something some day. I would judge the condition to be Near Mint, however, I am not any authority on grading cards so please caveat emptor. The picture is the actual cards being sold. Keep only those you want, cancel any time. It takes a long time to get the hang of playing Scroll Rack properly even in a normal deck. With a Scroll Rack, it's very hard for any card you draw to be bad. If you don't like it, send it back and get a new one! You'll draw it again, but that's fine. Send it back again. Scroll Rack turns your cards into a new type of resource. Every time you play a card and it leaves your hand, you've spent a card even if that card wasn't worth anything. Often players forgot this, and ended up with three cards in hand and a library full of cards they already knew were worthless. Better players used Scroll Rack to dig deeper and deeper into their libraries. Every card that you put into your hand was another card worth having, even if you had no use for it. The most famous use of this was Land Tax: Stay a land behind, and you don't just have unlimited lands. You have unlimited cards, and every turn you can search up the same three Lands... and shuffle your library! When you use Scroll Rack with shuffling effects you can look at a hand full of brand new cards each turn. With a full hand, the number of cards you could end up seeing skyrockets. If there's something you want, you'll find it. The weirdest part was constantly looking at and putting down three hands - your hand, the cards you need to put back and the cards you're picking up, looking to see what order you want to put the cards back in. It challenged players to think farther ahead than almost any other card. My husband and I used to play Magic alot back in the 90's and were even in an official Wizards of the Coast League. (It's true, somewhere I even have the little membership card to prove it - I was the ONLY GIRL in our whole local league. We have now decided to sell our collection to help defray the costs associated with having 2 kids. I will ship the cards in hard plastic sleeves and in a bubblewrap envelope. Check my other auctions - I will combine shipping - if you win more than one auction I will ship all for one shipping price. 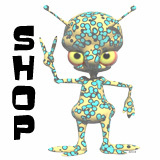 Check out my Sci Fi Website Sci Fi Jungle at http://www.scifijungle.com. Near Mint - This (probably) unplayed card shows almost no wear. It may have a few minor scratches or slight marks on the edges. Fine - This card has obviously been played, but not heavily. It lacks marks that would make it easily identifiable [if it were not played in a sleeve]. It has some minor scratches and/or less than perfect edges. It will show less than 1/16" depth of white along one or two edges of one face of the card. It may have a minor crease that is only visible close up. Good - This card has a played look to it. It will have white showing on three or four edges on both faces (meaning front and back). It may also have more than 1/16" depth of white showing on an edge on the back face of the card. It may also be a card that looks like a Near Mint card except for one distinguishing wear feature, such as a slight tear or easily identifiable crease. I did it. Since I took the day off today I went ahead and scanned and wrote up a listing for my first two Magic the Gathering cards I want to sell. I am now suffering from that Ebay elation that is like when you have a party and you are not sure if anyone is going to show up. :-) Its kind of nerve wracking. Anyway, here is a link to my Ebay Listing. Anyone wanna buy some Mox Diamonds? 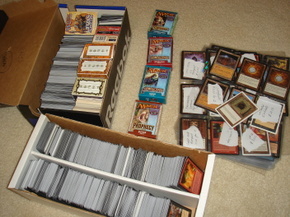 Having gotten all excited over the prospect of having a $600 Mox Ruby somewhere in my basement, I dug out three big boxes of Magic The Gathering Cards. I have started going through these and checking past completed Ebay auctions to see which, if any, of them are worth anything. I have come aross a number of cards worth anything ranging from a dollar, to 5 dollars, and on up to possibly $20 for a sinkhole card from Unlimited. My 2 Mox Diamonds may be worth about $15 bucks a piece. I don't think this is going to buy me a villa in Italy or anything, but being that shipping these cards is relatively cheap and easy, I think it will be worthwhile starting some Ebay auctions and see if I can get some pocket change together. I mean really, one can only blog about Embarrassing Moments for the Oyster Fisheries so many times. I think I need to supplement the bloggy income with some good old fashioned Ebay income.